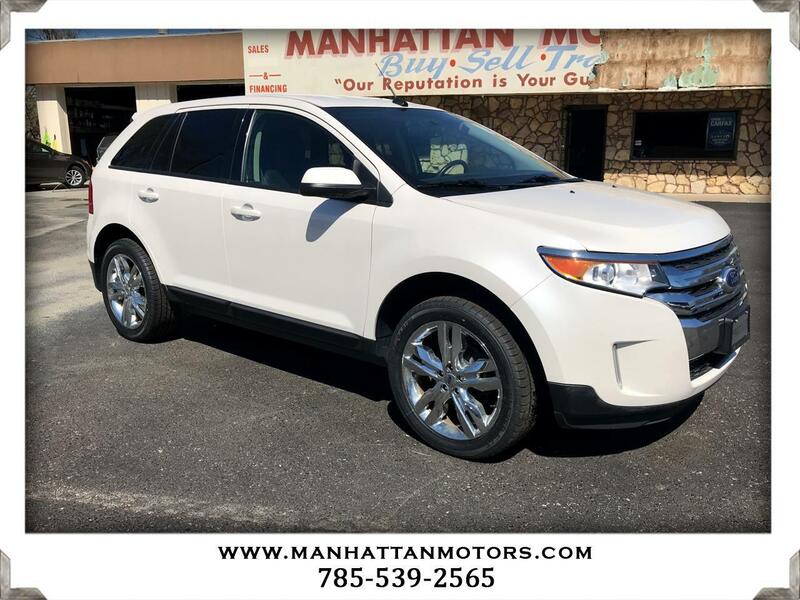 Distinctive styling and impressive technology make our One Owner, Accident Free 2014 Ford Edge SEL AWD shown in Oxford White a fantastic choice for your family! Powered by a 3.5 Liter V6 that supplies 285hp on demand while tethered to a smooth-shifting 6 Speed SelectShift Automatic transmission with Sport Mode. This All Wheel Drive combination inspires confidence and capabilities while achieving near 25mpg out on the open road. This mid-size crossover offers plenty of cargo space for your busy lifestyle while retaining a bold, dynamic style that commands attention with privacy glass, a rear spoiler and chrome grille. Inside, our SEL seamlessly blends luxury with high-tech, modern design. Voice-activated Ford SYNC, available satellite radio, navigation, a leather-wrapped steering wheel with audio controls, heated leather front seats, and dual-zone automatic temperature controls are just a few of the features you will enjoy. Plenty of leg-room, comfy seats, extra charging power points and storage nooks for all of your extras make the Edge the perfect car for the on-the-go family! Ford is an innovator of safety features as demonstrated by six standard airbags, a rear view camera, available SOS post-crash alert, AdvanceTrac, ABS with Roll Stability and Tire pressure monitoring. Plus, MyKey allows you to set controls for the teen driver in the house. This is an excellent choice you need to see for yourself. Print this page and call us Now... We Know You Will Enjoy Your Test Drive Towards Ownership! Thanks for choosing Manhattan Motors. We recently won The Manhattan Mercury Readers' Choice Award for being the #1 Used Car Dealer. Buyers enjoy our "laid back" approach. No test drive routes or high-pressure salesmen. Our focus is to offer all of the information you need to help make the best decision for your family or business. Each one of our vehicles undergoes a 30-point vehicle inspection by Burnett Automotive, Manhattan's #1 Auto Service Facility. We are also the area's only Independent USAA Certified Dealer, offering discounts on purchases and interest rates.